Prominently ensconced at the entrance of downtown Cary’s Ashworth Village, Klara’s Restaurant provides an inviting milieu to would-be diners and regulars alike. Klara’s represents the Triangle area’s first authentic Czech eating establishment. Prague-born Klara Novakova moved to the United States more than 10 years ago with dreams of opening a restaurant. Inside her namesake eatery, sunny yellow walls are adorned with picturesque vistas of Prague painted by Klara’s father. The main dining room’s antique pine floor is nicely balanced by a high-pitched ceiling that makes for an open yet not-too-expansive setting. A floor-to-ceiling handcrafted mural of the Charles Bridge, one of Prague’s most famous tourist attractions, spans the entire back wall. When it comes to the food, Klara’s extensive menu contains can’t-go-wrong items from start to finish. 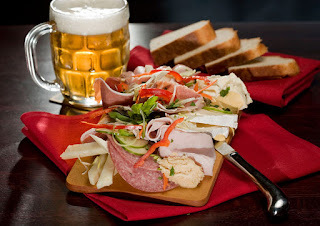 Among the nine available appetizers, particularly winning options include the soft-boiled egg à la Prague with cured ham served over a creamy potato salad; pan-fried potato pancakes with sour cream; and the sharable-sized cutting board, which comprises a palatable mixture of various cheeses accompanied with slices of rolled salami and prosciutto ham. Several main course dishes are worthy of serious consideration. Melt-in-your-mouth house-specialty roasted pork tenderloin comes served with sauerkraut and homemade potato dumplings. Chicken Prague features strips of tender chicken breast sautéed with mushrooms, peppers, onions and zucchini with potato pancakes. Then there’s the succulent roasted half duck with red cabbage and dumplings. The duck is only available on weekends or by request with a full day’s advance notice. If you are in the mood for red meat, opt for Bohemian roast beef. Want seafood? Whole trout with garlic sauce or the seafood kabob with salmon, tuna and shrimp should hit the spot. Strictly vegetarian? Homemade ravioli with spinach and ricotta cheese is a surefire choice. Without question, Klara’s has all the culinary bases covered and then some. As for pairing a flavorsome red or white wine with your meal, Klara’s offers a variety of robust selections by the glass or bottle, and most are positioned on nearby wine racks. Also served are Czech beers Pilsner Urquell and Czechvar in addition to well-regarded liquor Becherovka. Tantalizing made-in-house dessert options abound. Consider the scrumptious crepes with vanilla ice cream, the decadent chocolate lava cake or the house-favorite fresh apple strudel. Be sure to top off the experience with an espresso, cappuccino or café latte. Closed on Mondays, Klara’s is open six days a week for lunch and dinner. A convenient calendar of events is available on the restaurant’s Web site at www.klarasrestaurant.com. In a word, the Hermes Handbags are fabricated for females who honey spending their money on handbags.And you can bolt the best Louis Vuitton handbags designs for bargain costs.These canicule a well-dressed woman seems abridged after a Christian Dior.The movement was initiated in the United States, there are about five, where subsidiaries of watch brands have developed e-shops. The Americans soon became familiar with the Swiss Watches Web. A question of culture, but also and above all a Omega Watches matter of size of the territory.